In 2005 On The Move was approached to develop strategies on how to best engage the transition aged foster youth populations within Napa County. OTM gathered a group of ten former foster youth leaders in what would become an 18 month process to build the first youth-developed, youth-led community service program in the nation for transition aged youth. Through effective and innovative youth development approaches, VOICES has spread to four counties throughout California and served thousands of transition aged youth leaving various systems of care. The program focuses on empowering each youth, identifying individualized strengths and challenges, and working with the entire community to address these challenges. VOICES’ mission is to empower underserved youth, ages 16-24, by utilizing holistic services throughout their transition from systems of care, while building a loving community and establishing a solid foundation for a healthy future. At the core of VOICES are youth-led programs designed to address the independent living, housing, education, employment and wellness needs of transition age youth. VOICES serves approximately 1,700 youth each year. VOICES’ one of a kind Youth Engagement Model focuses on empowering each youth, integrating resources and services, and working with the entire community to address the barriers that young people face as they leave systems of care. VOICES youth are not only recipients of social services, they are active leaders in supporting their peers, guiding the evolving vision of program delivery, training growing numbers of social service agencies to become “youth-friendly”, and advocating for youth voice in the community. 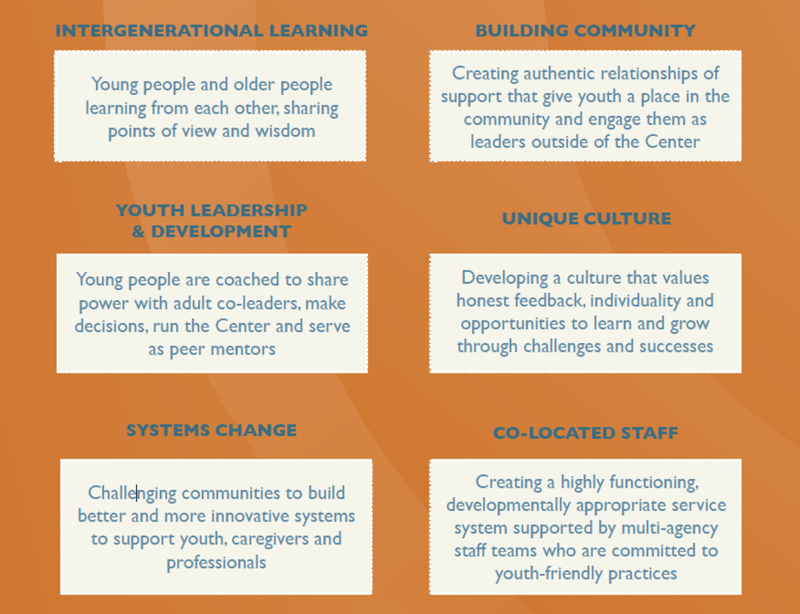 The VOICES model is built upon six pillars that result in a unique, highly effective approach to transforming outcomes for transition age youth. All youth are raised as leaders that see beyond their own experience and are empowered to make a difference in their communities. Youth are given the opportunity to act as a voice for themselves and others and to increase unity, promote justice, and create a clean and safe community for all. All youth feel the power of belonging, having a purpose and experiencing ownership of their community. All youth are building lifelong relationships and have adults that understand and support them and their needs. All youth are the architects of their own goals and plans for the future. Across the U.S., youth who have experienced foster care struggle to establish independence and find a path to a healthy life. Without the safety net that parents often provide to their young adult children, foster youth who “age out” of foster care face significant barriers as they seek a foothold in adulthood. Many times the youth are victims of a system that does not meet their individual needs. VOICES Sonoma, in partnership with Sonoma County Family, Youth and Children’s Division has completed the first phase of a three-year project aimed at improving services to older foster youth in Sonoma County. During the first phase of the project, a group of young leaders, all of whom possess direct knowledge through lived experiences in the foster care system, was charged with looking at how Sonoma County supports older foster youth. With the support of VOICES staff, the young leaders began studying the foster care system, examining resources and challenges unique to Sonoma County. 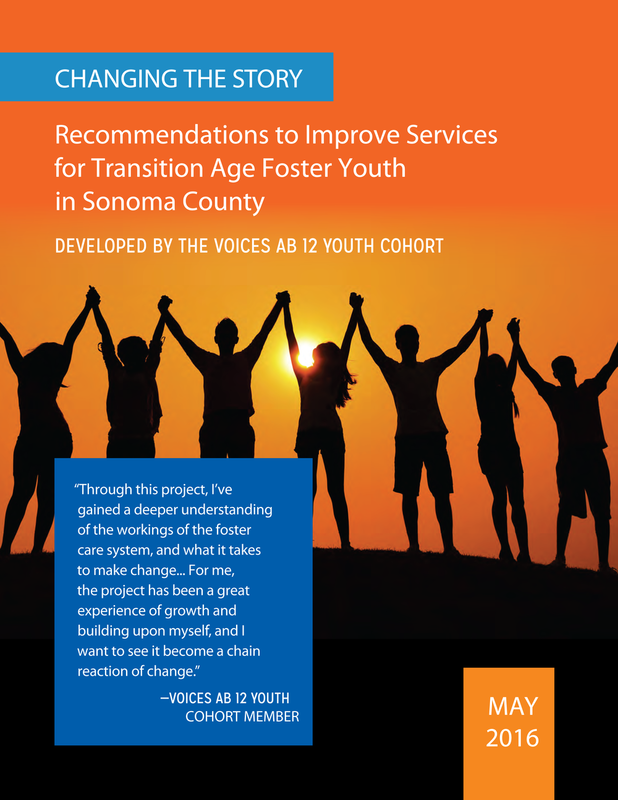 Through their meetings and research, the foster youth developed and refined four recommendations for transforming outcomes for foster youth in Sonoma County. The overarching goal of these recommendations is to improve the lives of foster youth by strengthening the ability of Sonoma County’s child welfare, probation, education, and housing systems to support their transition to independence. The recommendations have been described in detail in Changing the Story; Recommendations to Improve Services for Transition Age Foster Youth in Sonoma County. Each of these recommendations is both critically impactful and eminently achievable. To make these recommendations a reality, community leaders have joined together to form the Sonoma County Coalition for Foster Youth. County government leaders, nonprofit executives and other community partners have pledged to work in partnership with foster youth leaders to identify how to build and locate the necessary resources to make the foster youth’s dreams a reality. VOICES is a program of On The Move, a 501(c)(3) that partners with communities and mobilizes emerging leaders to take action in pursuit of social equity. Visit www.onthemovebayarea.org to learn more.